We have written about Nicola Tesla’s amazing patents for machines that tap into the natural vibrations of the Earth, its magnetic resonance and power of the sun to acquire free and unending energy but until now, his discoveries have only appeared in old photos and diagrams in books. Critics claimed he was a hoax, yet Tesla demonstrated his genius over and over during the years he worked among us. The problem was that Tesla was a poor man who was relying on wealthy benefactors to finance his work. And those benefactors, who included men like J. P. Morgan, Thomas Edison and John D. Rockefeller, seized his patents and buried them because of personal greed. They made their money selling carbon-based energy to the masses and didn’t want it known that free energy was all around them. What they didn't get their hands on, the U.S. government claimed for national security. Tesla gave us alternating current, fluorescent lights (40 years before industry “invented” them), X-rays, radio (in 1893, years before Marconi was awarded the patent), electric motors, remote control, lasers, robotics and wireless communication. He was an inventor but he trusted the men he worked with too much. Consequently he died in poverty in New York in 1943 while heavily involved in helping the U.S. war effort. Now, largely through the Freedom of Information Act, some of Tesla’s buried patents have been released. An organization called Fix the World Council is sponsoring the release of plans and even the sale of Tesla’s Quantum Electric Generator (Patent No. 511,916). Spokesman James Robitaille said the modified and modernized generator is relatively easy to build, is about the size of a modern gas generator, and strong enough to power an average home. It can be set up to provide either 120 Volt or 230-240 Volt single phase output. The generator is the group’s “pilot project to distribute to the world,” Robitaille said. It was invented by Tesla in 1888 and simply called “Electric Machine” when patented. 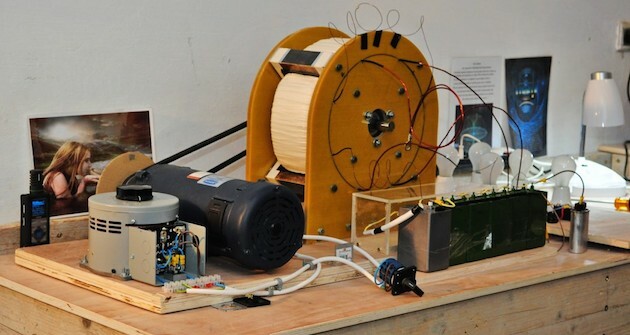 In a statement introducing the release of the information about the Tesla generator, Robitaille explained that once the machine builds enough resonant frequency, it powers itself. For those who might understand the technical explanation, he said the machine’s exciter coil is external to the generator “and the excitation signal is conducted through the quantum field (zero point) into the generator core to start oscillation. “The QEG is not a complicated device, as it is designed to work in harmony with natural laws rather than the power wasting symmetric motor and generator designs used in today’s mainstream industry,” Robitaille wrote. To download the plans and directions for building this generator go to THIS SITE. And for more information about Fix the World Council and the generator click HERE.